Once again, not being on the uncontested calendar, our bill had to be read and then Senator Deeds had to defend it. If you watch the video, please ignore the apparent snicker or sigh that happens around 8 seconds in. ...I'll bet I have a 33.3% chance of guessing who that was! Anyway. The awesome news is..... We passed the Senate. Now we go "down the hall" (as they say) to the House. The House seemed like it had 483928734 different license plate bills coming up this year; I'm not sure how many made it through, but I hope they will be nice to us. Gotta go work on my Richmond Environmental Film Festival presentation now but will be updating as I see more updates from the General Assembly. On to the 3rd reading! SB259 was engrossed and advanced to its 3rd reading today! Hooray! Back when I first started following this session of the General Assembly, I would have had no idea what that meant. But now I know that it meant the bill successfully passed its 2nd reading. 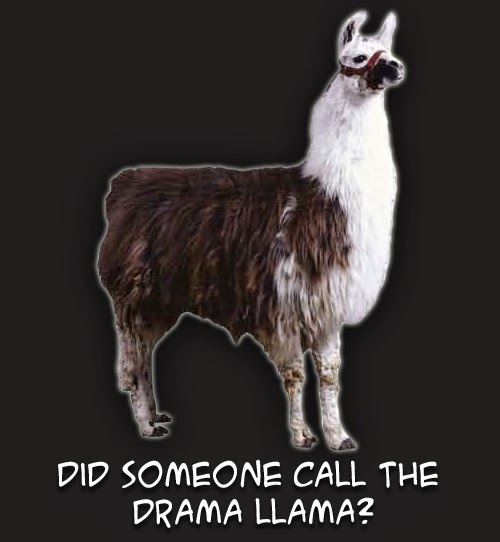 ...The reading where legislators can start some drama... if they want. Last week when the bill reported to Senate from Committee, it passed 12-1. I was a little bummed- but not surprised- about the 1 "No." But today, I was really excited about it. If the vote had gone 13-0, the bill would have been in the "uncontested" calendar. Usually they go through the uncontested bills pretty fast- a senator (not sure yet how they pick who does this; this session it seems like it is always Senator Norment) will move that all bills on the uncontested calendar on their (x) reading be engrossed and advanced to the next step. Then they vote to advance them all forward as a group, and afterward, the clerk reads out just the numbers of all of the bills in the group, in case a senator wants to speak up about a specific bill before moving forward, or delay it for a day.... etc. But the bills that aren't uncontested- meaning, they had at least one "No" against them- go on the Regular Calendar. These are usually each read individually- the number, title, and a summary. Then the sponsoring Senator will stand and move that the bill be engrossed and advanced. Then the senate votes (the 2nd reading is a voice vote). 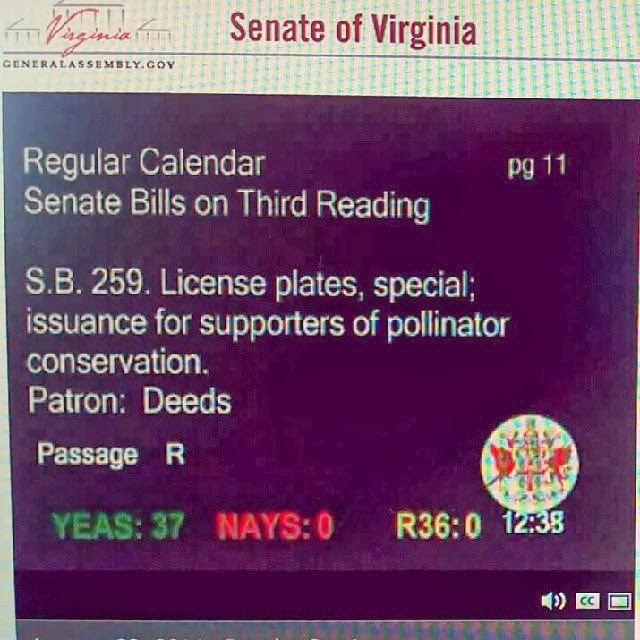 So Watkins' vote "No" on SB259 pretty much got the Pollinator Plates their very own personal shout-out on the floor today. Tomorrow the bill will go to its 3rd reading. I am not 100% certain whether it will be grouped in with the uncontested bills and voted on as a group, or individually. But tomorrow's vote will be with the voting machine, not a voice vote. If it passes tomorrow, SB259 will go to the House and (I think) to their Transportation Committee, which meets Tuesdays and Thursdays. I would guess this coming Thursday they would get to it; but if not, probably next Tuesday. And after that, the house will vote. SB259 Reports to Senate from Transportation Committee! Well, what an exciting day I had today. I'm not even sure where to begin... 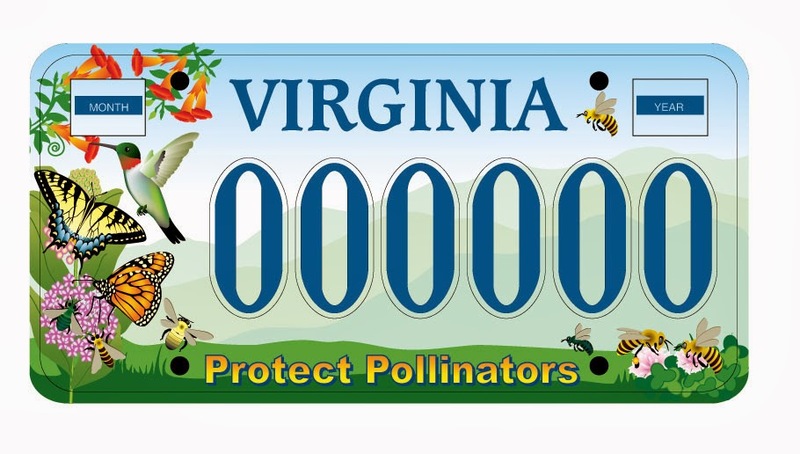 But you can scroll down to the bottom of this post if you don't like stories, and you will see that the Senate Transportation Committee voted in favor of the license plates, and they'll go to the Senate Thursday (tomorrow) or Friday. Yay!! 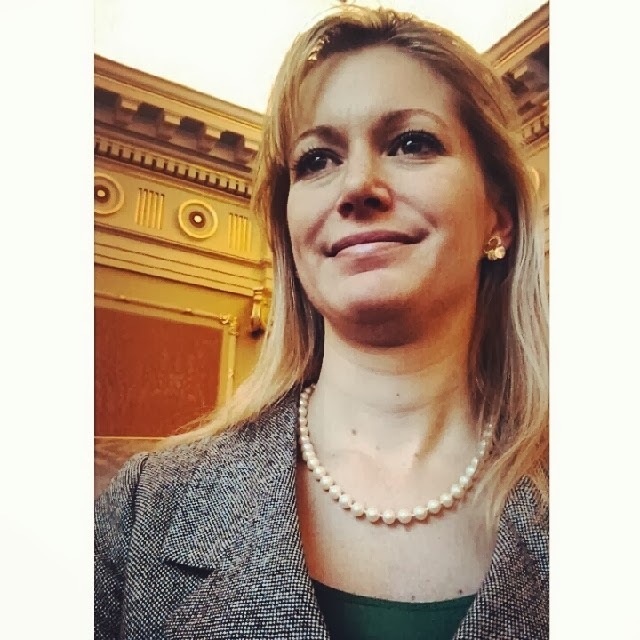 Last week, Senator Deeds' aide emailed me to ask if I could be in Richmond today (Jan 22) to testify on behalf of the bill in front of the Senate Transportation Committee. I had planned to be there anyway when it was introduced, just to see for myself what happened..... but now that I knew my presence could possibly help the bill, there was no way I wasn't going. ...Even with Winter Storm Janus possibly threatening to keep me imprisoned at home. I would've walked to a bus stop, at worst, and somehow, some way, found a way to get to Richmond. Except I didn't have to resort to that, because last year I traded in my cute yellow car and got a practical and fun SUV with all-wheel-drive that was pretty much made for this weather. Thus, this morning I woke up early and dressed in the outfit it only took me 3 hours to pick out (heyyy, many, MANY outfits must be considered for serious business like this). Then I loaded ALL 473 of the applications, my lunch, coffee, a pair of black gardening clogs (for walking in the slush), and myself into my lil' Subie and set out on the unpaved roads. I was certain that I-95 would be full of people driving 30 mph and it would take me at least 3 hours to get down to Richmond. But not too many people were out, the roads were surprisingly nice, and I made it down there by 11:00am. I found parking and walked only 2 or 3 blocks to the Capitol complex, but it was freeeeeeeezing. It was only 18 degrees when I parked my car, and so windy! I went to the gallery to watch the Senate Session. I've been listening to them via the Live Feed pretty much every day, and it's so interesting. But in a way, I feel like a stalker, or like I'm spying on them. Today was much different than watching online because I found out almost all of them are eating lunch while in session, haha! You could constantly hear soda cans popping open, and there was a lot of other talking and things going on that you don't hear on the online stream. The other thing was how fascinating it is to see a vote. I don't even care what people are voting on. On election day I'm sitting there glued to the TV all day, long before any votes actually start coming in. Today was similar. Listening to the different comments, and I could clearly see the little board and the green or red squares next to everyone's names, and who voted which way, who changed their votes... I can't believe more people don't sit in there and watch this. If I lived down there, I bet I'd be there every day at lunch to see what's going on! After the Senate session adjourned, the butterflies started in my stomach and I began to get a little nervous- the Senate Transportation Committee meets just 45 minutes after Senate adjournment. I walked to the General Assembly building and finally got to meet Senator Deeds' aide, with whom I've been communicating for sooo long now, and then briefly got to meet Senator Deeds himself. He was exactly as I was expecting- a warm, genuine person with an infectious smile. He seemed super busy, so I didn't want to stay and bother him for too long. I wished I could have stayed longer and given him a more proper "thank you" for introducing the bill and being so nice, and I would have liked to have gotten a picture with him, too- but maybe this summer, after the bill passes, I can stop by his office and thank him again. 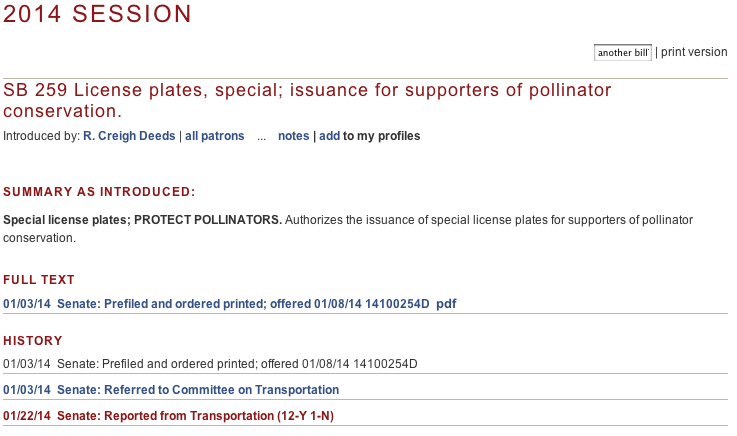 at 1:45 the Senate Transportation Committee meeting began and around 2:30 the pollinator plates were introduced. There was a little confusion- or maybe that was just on my part, since I am the one who isn't totally familiar with the process- but after deciding SB259 would not be combined into a bill with other license plates, I got up to speak on behalf of the bill. I started to think maybe I didn't need to be there, as it seemed they were about to quickly move along without me- but when I went up to the podium, everyone smiled and seemed welcoming. I shortened what I had planned to say by about half, since I got the impression the bill was going to pass whether I told them why I created the plates or not. I think what they wanted to hear was "I'm speaking in favor of this bill" and "I have 473 applications...." Done. I waited to see if they had any questions, and the next few seconds were a blur... because I looked over at Senator Deeds and he smiled and nodded, like I didn't need to do anything else, so I returned to my seat. As I walked to my seat, they did the vote, and it happened so fast.... I missed it. Kind of. I sat down and was a mix of things- confused and happy and sad all at once (and shaking horribly). Sad that I missed it, confused wondering, did I just miss it!?!?? But happy that I didn't remember hearing a bunch of people yell out "No!!" Plus in the committees, there is no fancy illuminated board with names and lights and squares to look at. You gotta be on your toes. I'm just.... going to leave that here, for now. One of the things that had to be changed was the word "Virginia" became a standard blue, as did the numbers on the plate. Sounds like within the last year or two, a law was passed standardizing that on *all* the plates now. I also deleted the decal sticker illustrations and left only the template "month" and "year" boxes. The mountains in the background have been lightened up, to make the plate number stand out more. The hummingbird was moved over a bit, in case that first "0" becomes something like a "W" and could end up too close to the bird. I think that was about it. It took some getting used to, but I'm really liking the blue now. I still hope everyone thinks they're BEEutiful and will be excited to get theirs- I know I am! Cheers for now and I'll keep ya posted! The bill for the plates has been pre-filed in the General Assembly! Or you can look it up by number: SB259. The General Assembly will convene on Wednesday, January 8th. Some time after that (I'll post when I find out), our bill will be introduced and they will vote on it. If I can find out when that's happening, I hope to go see it in person! Thanks so much to everyone who has signed up for a plate, especially those first few who signed up over 3 years ago! Your support and patience means the world to me, and it's so exciting to see this finally happening!